Slow Cooker Chinese Hot and Sour Soup makes it super easy to make your American Chinese restaurant favorite at home. 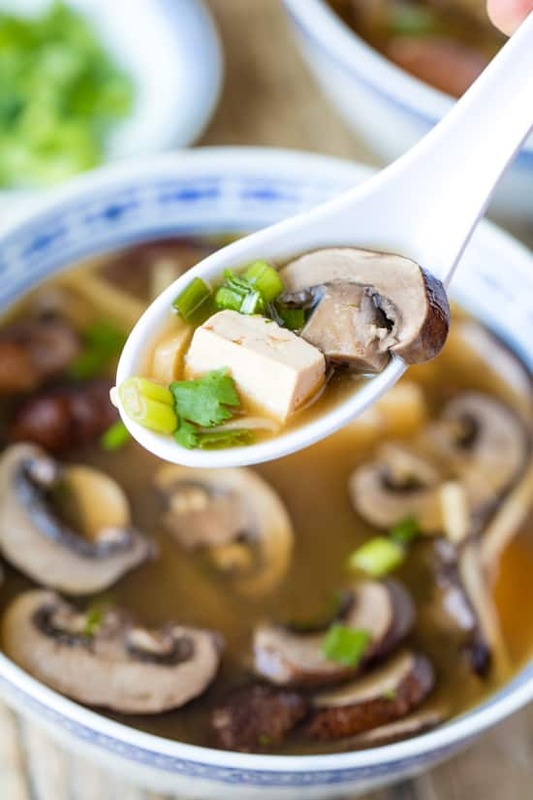 Whether you are celebrating Chinese New Year, or simply making an every day meal, this Slow Cooker Hot and Sour Soup is an easy and delicious dinner. This isn’t exactly an authentic Chinese recipe, but I’ve made it as easy as possible so that anyone and everyone can celebrate. It just doesn’t get any easier than the slow cooker! Toss it in and come back later for a delicious meal! Chinese New Year is the celebration of the new lunisolar Chinese calendar. It has been celebrated for centuries. There are lots of fun traditions, myths, and superstitions that go along with it which makes it easy for the whole world to get involved. It’s a fun little celebration meant to bring families together, and what better way to do that than with food? This recipe uses tofu. I almost never use tofu in my cooking, but this is one of the few recipes where it’s absolutely necessary. If you aren’t familiar with tofu, I’ve got you covered. What is tofu made out of? Tofu is a soybean product and is made by compressing curdled soy beans, very similar to how cheese is made. Tofu is high in protein and is often used as a meat replacement. Tofu has varying textures and levels of firmness depending on the protein content and how much water it contains. What are the different varieties of tofu? Tofu is sold at various levels of firmness, starting from the softest: Silken, Extra Soft, Soft, Medium, Medium Firm, Firm, Extra Firm, and Super Firm. You may see all, or only some of these firmness levels in your grocery store. The firmness level is determined by how much water has been pressed out, so more firm versions contain the least amount of water content. In this recipe you want to use a firm tofu as it will absorb the most flavor while still holding its shape. Watch the video below where I walk you through every step of this recipe. If you like this recipe you may also be interested in my recipe for Hot and Sour Shrimp Wonton Soup. Pour chicken broth into a 5 to 8 quart slow cooker. Stir in soy sauce, rice vinegar, bamboo shoots, mushrooms, ginger, sriracha, white pepper, sugar and tofu. Cook on low 6 to 8 hours, or high 3-4 hours. Stir in cilantro and green onions just before serving. Serve hot. So yummy. I used coconut aminos instead of soy sauce. And I did it Steve top. I made a half batch in case… but I immediately had to make more. Lol. YUM! Hi Rachel. This looks absolutely delicious! 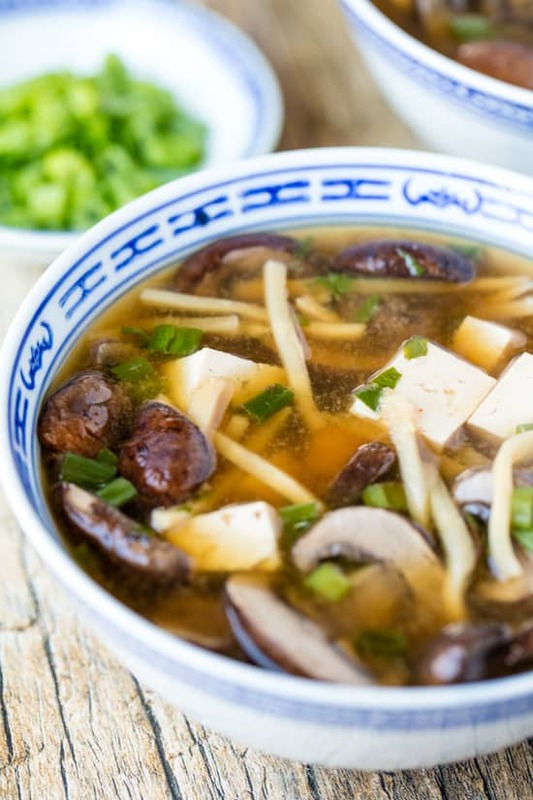 I love hot & sour soup and despite having a few recipes that are pretty quick and easy to whip up for dinner, I’ve been looking for a slow cooker version so I can set it all up at once and not worry about it until it’s done. 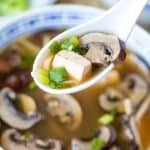 I’m curious if you found the broth to be an OK consistency at the end (it’s hard to gauge in the video, but it doesn’t look necessarily too thin – just average maybe) or if it should be thickened up with a cornstarch slurry for those of us who enjoy the style of hot & sour soup with the much thicker broths. If adding a cornstarch mixture, should that be done before or after it’s cooked? Perhaps add it in with 15 or so minutes left to go? Thank you! A cornstarch slurry would be added at the end. It should thicken up rather quickly with just a few minutes of stirring. Tried this today. was very pleased with the result. I let mine cook a bit longer, but followed the recipe otherwise. Not sure how anyone could say it was bland. Thank you for the wonderful video! no sugar…make mine from scratch sugar is just why? I’m a one woman show here and I do my best. Sorry you don’t like it. I am so impressed with your take on this take out classic and can’t wait to make it! You so such an amazing job making intimidating dishes so easy! Thank you for sharing your gifts! I don’t know what there is about the video that Michael doesn’t like. It is well done, easy to follow and perfect quality. Just one little thing, I don’t recognize a few of your cookbooks behind you. Care to share your favorites? Thanks so much for your work, every one of your recipes have been enjoyable for us. Rachel, the video was fine. Great so. Thanks for what you do. Some people are just the sor in the soup! Your recipes are always top shelf IMO….Been wanting to do a S&S soup so this recipe came at the right time. 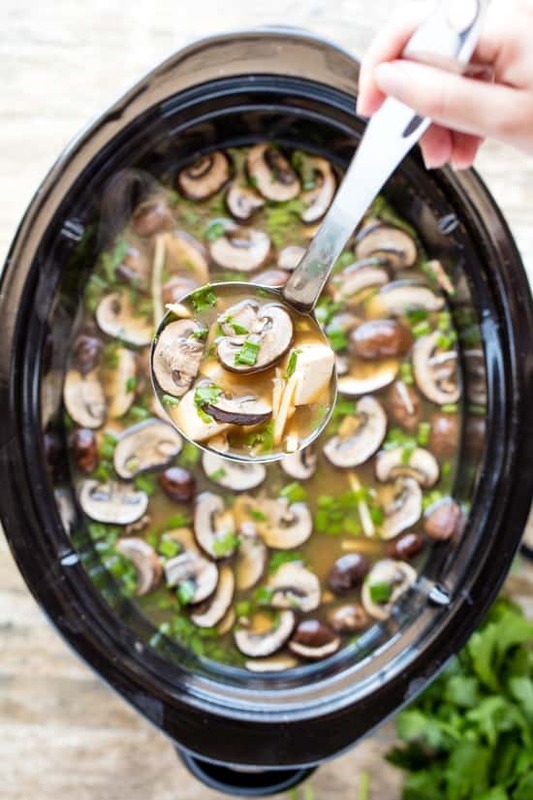 Will let you know how great it was…..
I’m always trying out new recipes for healthy soups ( I eat healthy during the week), and this one sounds great. I prefer firm tofu to soft, and will likely add a beaten egg for a little extra protein. And let me tell you, anything I can throw in the crock pot is a plus in my book. Amazingly delicious!!! Will make again!!! Sorry you feel that way! There are a lot of really flavorful ingredients in there so I’m not sure how yours ended up bland! I used dried mushrooms and then rehydrated with hot water. I then added the mushroom broth to the soup. It was the perfect addition to add more flavor. I made this, portioned out the leftovers and froze for lunches. It so easy and tastes just like my fav Chinese take out recipe. I give it 5 stars! Can you make it without the tofu? You’d be left with mostly just a good tasting broth. Can you sub chicken for the tofu? I’m sure you could! This is one of the few recipes where I actually prefer tofu. Weird, I know! Just wondering how it is after being frozen and reheated? I so want to try this! I love hot and sour soup…when we order Chinese, I always order it. I have never attempted making it though…it's a lot easier than I thought. I need to try this!